A story on Talk of the Nation earlier this month piqued the interest of my inner urban planner and transportation geek. It was about the efforts of traffic engineers to design intersections that minimize potential points of conflict and maximize the flow of vehicles. 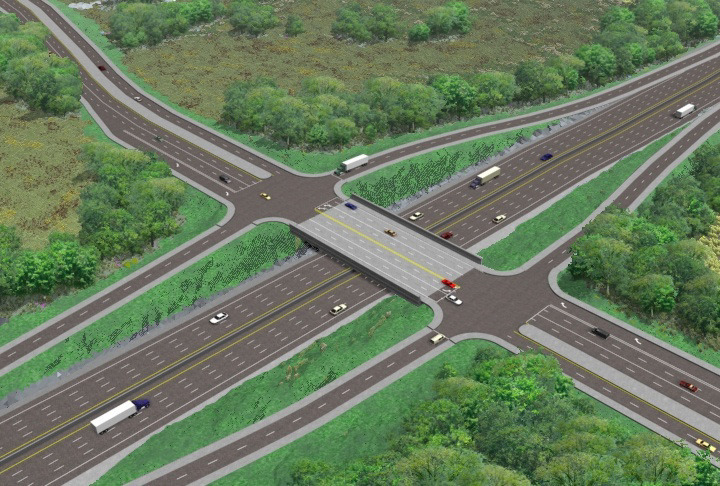 Particularly, they talked about something called a “Diverging Diamond Interchange” or DDI. The classic diamond interchange is very inefficient and results in nearly two dozen points of potential conflict between cars going different directions. Every left turn, whether to enter or exit the freeway, results in the rest of the traffic having to stop. One solution known as the “Michigan Left” (because it is used mostly in Michigan, I suppose) is a relatively dangerous solution that has drivers making a u-turn about 200 meters after the intersection, then making a right-hand turn at the intersection. The disadvantage of these uncontrolled u-turns is that one thing drivers don’t do particularly well is judge the speed and distance of oncoming vehicles. Another solution is the SPUI – Single Point Urban Interchange. This design has all traffic coming together at a single intersection controlled by a single set of lights. I’m familiar with this as it is the new design that was built near where I used to live in suburban Kansas City. It is an elegant design but still has some problems, not the least of which is that the space in the middle of the intersection is very large and people can get lost. I’ve observed this on several occasions, where cars have drifted into the wrong direction, especially at night when traffic is light and visual cues (like the headlines of oncoming cars) not so available. If you have never had the pleasure of driving through an SPUI and are curious how they work, here’s a nice short video that shows an animation of traffic going through the intersection. As you approach the traffic signal, the lanes of traffic curve slightly to the left, passing oncoming traffic (which waits at the light) at a 25-degree angle. As you travel through the signal, you are on the left hand side of the road. If you are turning left onto the freeway, you simply make a left-hand turn without waiting for a light. Through traffic keeps on moving, not having to stop for cars waiting to make left-hand turns. After passing through the second intersection, traffic crosses back over to the right-hand side of the road. 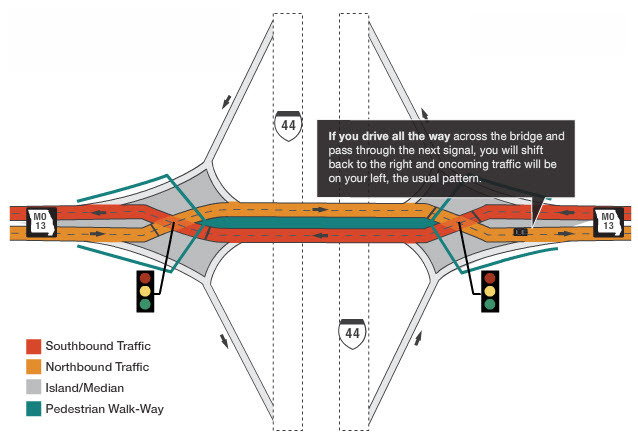 Exiting from the freeway to go left onto the arterial road, you merge and do not have to go through an intersection. 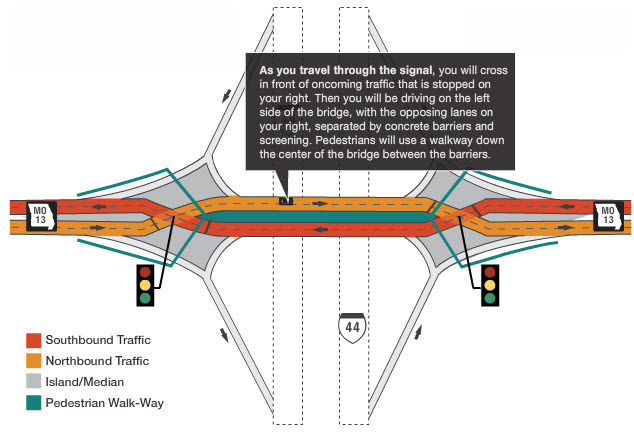 Entering the freeway with a right hand turn is also a merge and does not require you to go through an intersection. In all, the traffic flows much more smoothly. Here’s a short animation that shows the traffic flow. There are multiple safety benefits. Traffic keeps moving, reducing standstill time and the risk of rear-end crashes. 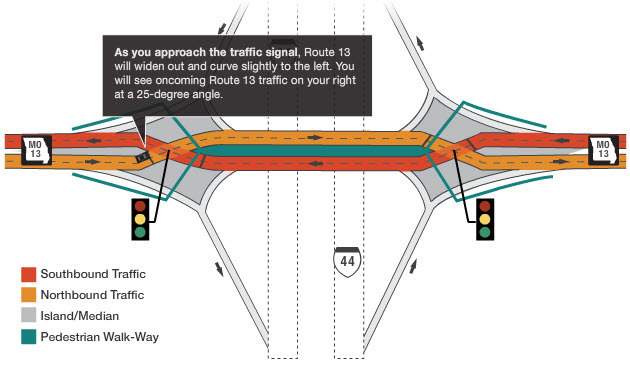 Right-angle crashes are eliminated for drivers turning left onto the freeway, as they no longer cross oncoming traffic. Finally, fewer intersections and independent directions to cross those intersections means fewer collisions caused by people running lights. All told, I’m sold on the Diverging Diamond Interchange. Looks like a great way to improve traffic flow and reduce the risks of accidents. One other option that is interesting is something called the Pinavia interchange, which I guess has been built in Europe. It is an elaborate interchange that requires no intersections and is aesthetically pleasing, too. Above is a brief animation to give you an idea of how it works. Anyhow, that’s enough urban planning/transportation geekiness for today. But isn’t it fantastic, the things you can learn on NPR? This entry was posted in Uncategorized and tagged Diamond, Diverging, Engineering, Highways, infrastructure, Interchange, Intersection, Roads, SPUI, transportation by christao408. Bookmark the permalink. Some intriguing solutions. If there’s enough land, the last one looks outstanding — but there’s nothing more horrible than a plain one-level traffic circle that is too small! Interesting concept for the DDI. The Michigan Left really is dangerous especially in heavily trafficked areas. Cameras were installed at intersections to better manage the flow of traffic, but I’ve never noticed an improvement with that method. Nice work on this, interesting. Interesting! That last one looks great, though very space-intensive, right?The one you spent most time on looks really interesting too, but is there a danger of wrong-way crashes at all? I’m really confused, maybe because what you have posted, we never have here. Our changing directions happen with a number of overlapping ramps on different height levels. We never have traffic stop unless there is a crash or construction.But I must be confused because we don’t have anything like that in the part of Canada to which I live. 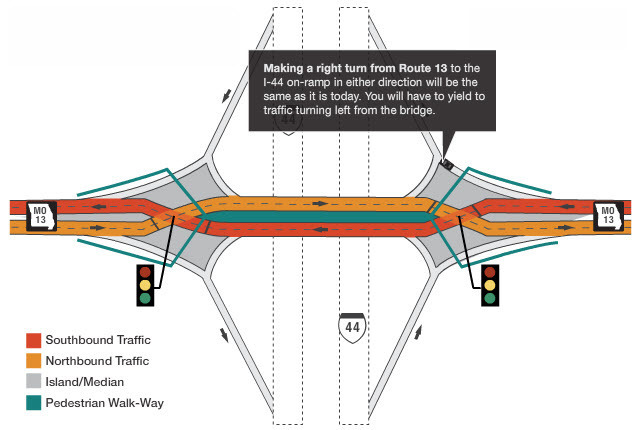 Interesting solutions – here it is the traffic circle. If there were traffic signals in the first video then it would be so easy.. but the highway traffic would have to stop. I like the last video. You don’t have geekiness in you.You are just so multitalented, and never cease to amaze me with your knowledge. I like the idea of less stops, that’ll minimize rear end collisions for sure. I like the background music for the last video. Fascinating! Left turns are the bane of driving, as any defensive driver will tell you, because they require the cooperation of the oncoming traffic. I go out of my way to avoid left turns ALL THE TIME. 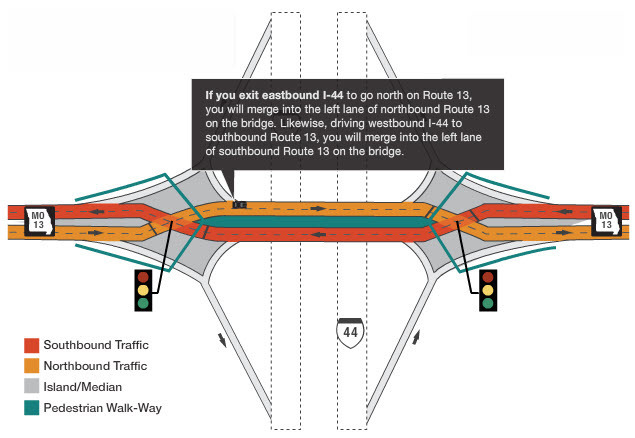 there’s one potential problem with the ddi design, though, that will cause traffic mishaps. when the lanes swap, the “fast” left lane becomes the “slow” right lane and vice versa, so people who want to exit the highway actually have to get into the left-hand lane. 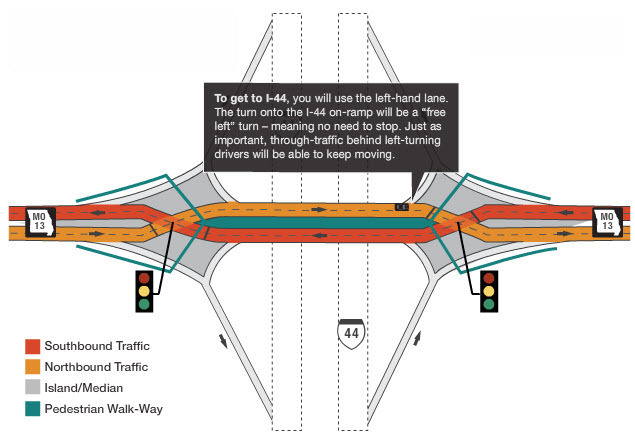 this may begin to slow down traffic prior to the intersection, especially since all the people traveling in the “fast” left lane will then tend to want to cut over into the right lane, so you’ll have a lot of people cutting back and forth every time these intersections come up. i kind of like the pinavia exchange a little more, although it takes up a lot more space and realistically the “useable area” in the middle is not likely going to amount to much. I am unlucky enough to live close-ish to both a new Michigan left and a Single-Point interchange, and they are both incredibly confusing, especially the first time you go through them, and the Michigan left was made safer by putting lights at the U-turn points, so instead of one light at the intersection there are three. 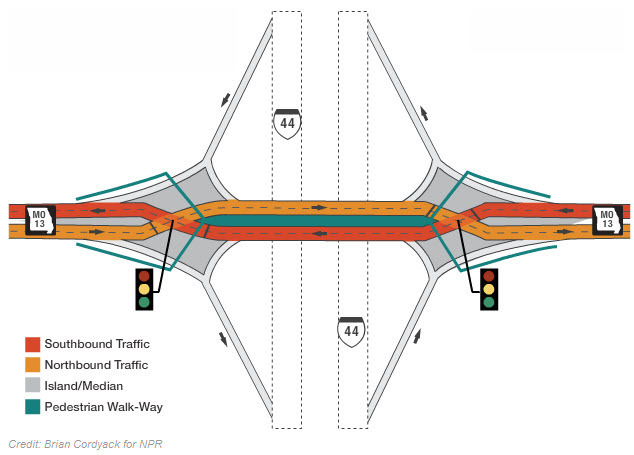 The Diverging Diamond is a really cool idea, but unless they were adopted wide-scale it would be too confusing – like others have said, I would be afraid of a lot of wrong-way crashes. Yeah, Michigan Left would not work on highways. Sorry, this is such a waste of resources! Pouring in tonnes of concrete to ease a mode of transportation which is definitely not viable for long in its current form! I don’t know why the Americans keep focusing on building infrastructure for automobiles instead of investing that money into developing sustainable transportation modes. @Dezinerdreams – In a lot of cases, the bridges that are being replaced are already existing bridges and interchanges. They are often 30+ years old and in need of seismic reinforcing, etc. so they aren’t building more inasmuch as they are improving what already exists. I agree that more non-automobile infrastructure needs to be built. The Department of Transportation did issue an order recently that federally funded transit projects should give equal weight to non-motorized forms of transit such as bicycles and walking. @yang1815 – And yet they use them there all the time! @TheHiddenPartofMe – @cmdr_keen – My understanding from the NPR story and interview is that the DDI is actually the safest in terms of potential crashes. The two sides cross at a 25-degree angle, enough that it would be very difficult to accidentally turn into oncoming traffic. Fewer points of conflict than in other designs for intersections, too. @kunhuo42 – I see your point. What would probably end up happening is that traffic would slow down a bit going through this intersection, just by virtue of lanes changing, etc. The traffic would keep moving, but would be at a slower speed than a traditional diamond interchange. That may actually be a good thing. @ordinarybutloud – So does UPS and FedEx! =D@CurryPuffy – Oh, you liked the music did you? That certainly makes it seem like a cooler interchange! @ZSA_MD – The first one of these in the US is in Missouri – Springfield, I think. You should go report on it for us! @Fatcat723 – Yes, we have several traffic circles here in Bangkok, too. I quite like them as they really force you to PAY ATTENTION. Heaven forbid drivers do that, right? =D@haloed – Interesting. I’ve traveled to several parts of Canada and don’t recognize the type of interchange you are describing. No doubt it is much more efficient than what we have in the States! Ha ha! @girlForgetful – Yes, with the Michigan Left it seems that cameras, lights, etc. are all needed to keep them safe. Glad you foudn this interesting. 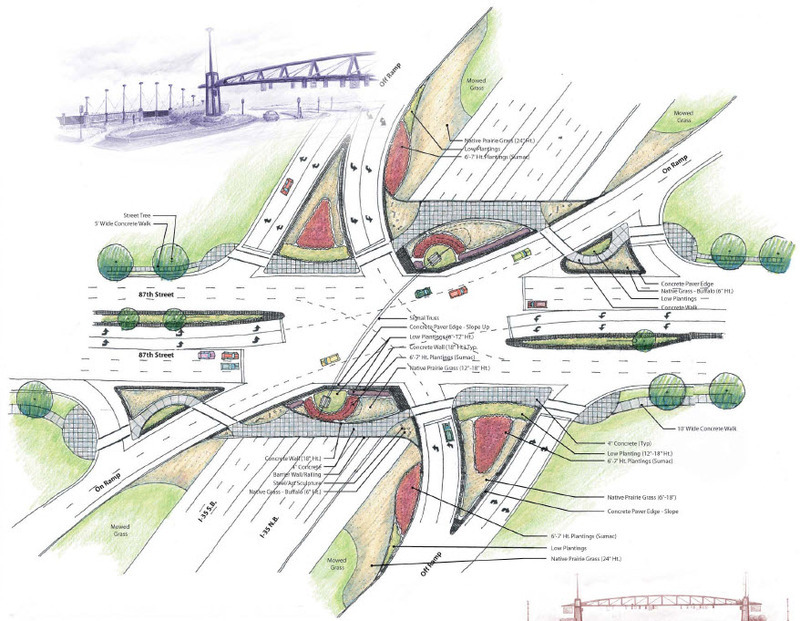 @slmret – Another video I saw of that last interchange proposed a significant urban center in the midst. Basically, the size of the circle would be large enough for a small core of buildings, maybe 20 or so. @christao408 – It’s mostly Michigan Turns in Taipei! Wonderful explanations. I almost got dizzy watching some of the videos hehe. I am not comfortable with round about at all, kind of try to avoid them if I could. Just a personal thing. Whoa that’s extremely geeky, Chris. I was interested but not in THAT much detail haha. I now realise I’m not a very detailed oriented person based on this. I think a lot of drivers will have to go to some form of driver ed (maybe online training?). The SPUI and DDI look kinda confusing. The last one looks pretty interesting. 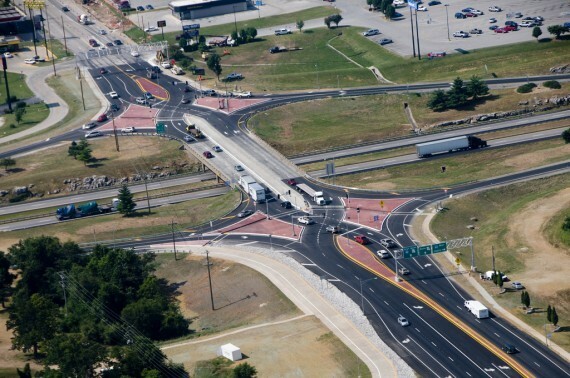 @ElusiveWords – Well, as a blanket statement it is probably true that a lot of drivers will have to (or at least, should) go through some form of driver ed, even if they are using the current styles of interchanges!